The material underwent extensive testing for its suitability for the intended use by Dyckerhoff GmbH, external test laboratories, universities, and customers. There follows an excerpt from the test results. In addition, tests for determining the abrasion resistance, resistance to alcohols, compressive strength at fire temperatures for design at elevated temperatures, for creeping, shrinkage, pull-out values of threaded sleeves etc. 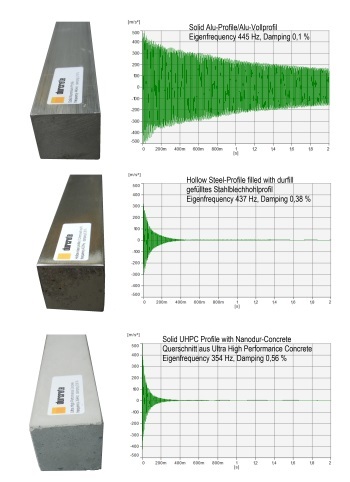 The behavior of NANODUR® UHPC in the recommended range of application is linear elastic (Hooke’s straight line). In the following, a few parameters are provided as input data in a simulation, e.g. by finite elements. Reinforcement or steel fibers do not increase the ultimate load for the formation of first cracks and so are not usefull in machinery constructions. The tensile resistance strength of the cement paste is high enough, to bear all loads without damages. Why Cement as a Binder? Test on the RWTH-University in Aachen show that elements made of Nanodur-Concrete E45 have a better longt term stability of deformation than epoxid based mineral cast and that the behaviour is similar to natural stone like granite. Cement-bound concrete is a durable material that has been time-tested for centuries. No solvents are needed for production, the fresh, but not yet set material, is washed with water. The necessary release agents are available as vegetable-based emulsion. Following completion of their service life, the raw materials need not be disposed of in a landfill, but can be reused as aggregate, e.g. in road construction are as recycled concrete. 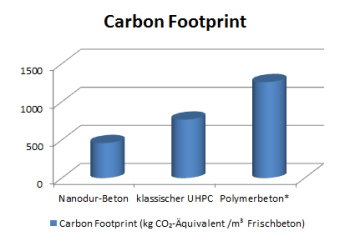 For the production of nanodur-concrete, less energy is used and less CO2 emitted than in the production of reaction resin concrete (mineral cast), steel or cast iron. Please send us an e-mail for further information and test results as well as calculation bases for FE simulations. From the plethora of information available, we will then select the parts relevant to your intended application and send you the test reports, if you need the precise test conditions. The given technical characteristis of the UHPC are valid at normal temperatures. Applications in the high temperature range are also possible, please ask for the technical data. Production in the laboratory and in the plant as well as the flow behavior of Nanodur concrete can best be seen on our videos. You will find more detailed information on the binder Nanodur Compound on the download page. The data provided are of a general nature and may therefore not be suitable for a specific application. As a result, tests, calculations, and experiments on a case-to-case basis are required prior to use of the products. The data provided in these information sheets do not constitute a guarantee of quality. Defects and claims for restitution and damages are excluded by virtue of this statement. Proprietary rights of third parties must be observed.